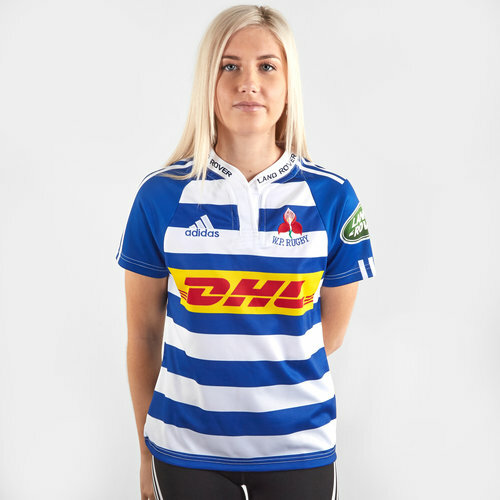 Cheer on Die Streeptruie when you pull on this adidas Western Province 2016 Super Rugby Ladies Home Replica Shirt. The South African rugby union team are based in Newlands, Cape Town, and participate in the annual Currie Cup and Vodacom Cup tournaments. The team has won multiple titles, a record of 34 Currie Cup titles including the inaugural competition, the Vodacom Cup, the Absa Nite Series, and the Lion Cup. The club has the most supporters of any Currie Cup team. An accomplishment of Western Province, which no South African team has ever been able to match is the double victories over the All Blacks the first being (10–3) played on 15 August 1928 and again (12–11) on 16 July 1976, while several countries have never been able to beat the All Black team, Province managed too. Since 1983 Western Province has been sponsored by adidas. the shirt uses the team's traditional blue and white striped design and has blue sleeves. The adidas logo is on the right whilst the club badge is on the left. The classic adidas 3 stripe motif can be found on the sleeves in white whilst the team's main sponsor - DHL - can be seen printed across the middle of the chest.